Green roofs, living walls, and vertical gardens are making their way into more and more urban areas. Green roofs have been around for centuries – the Vikings in Scandinavia were known for using sod or grass on the roofs of their homes – and there's a good reason way - they're beneficial for the homeowner in that they provide good insulation, and they're also beneficial for the area at large, as a green roof filters water, permitting a slower return back into the urban sewer system. 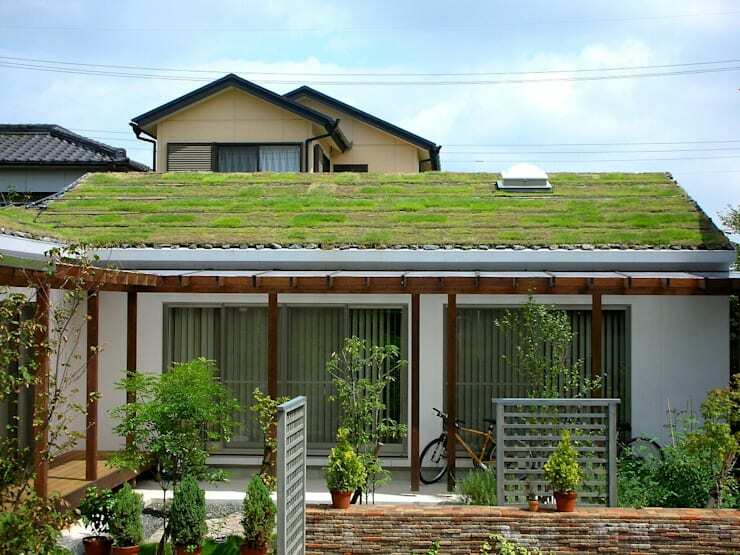 This Japanese home created by architects from Oguri Architecture features a green – or living – roof that supplies a little slice of nature in this urban area for all of its neighbors to enjoy. 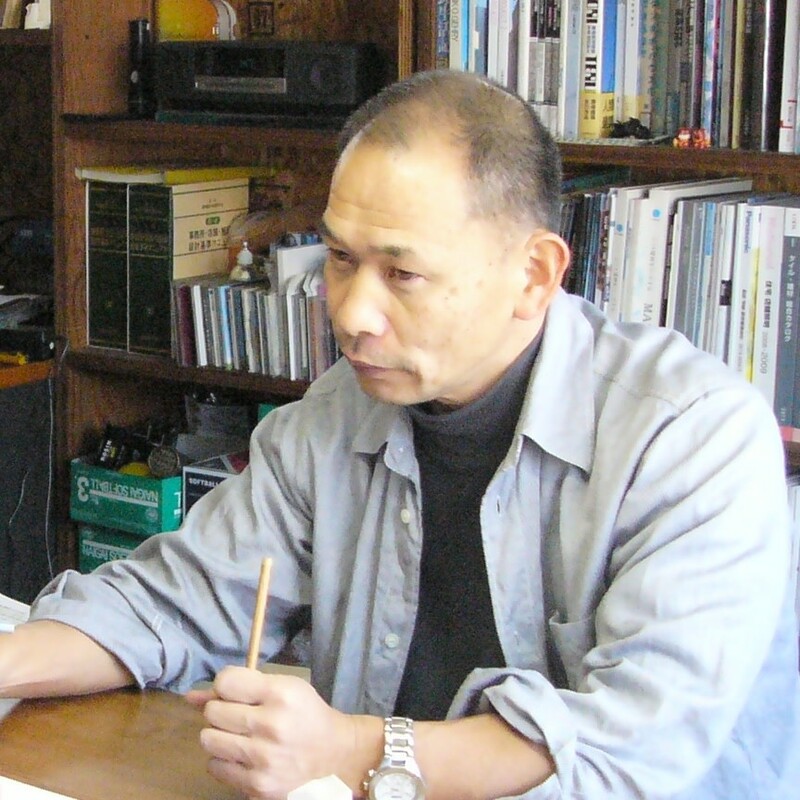 But the bill doesn't stop there – the interior of the home as also been designed with a large variety of raw, natural materials that make this a very down-to-Earth dwelling. Here, this L-shaped home embraces an intimate garden full of small trees and shrubs, while the roof overhead provides another calming green surfacing. The design of this L-shaped structure allows the family to enjoy their garden to the fullest as the home seems to wrap around the garden, creating the effect of an outdoor room (easily visible through the large windows!). If you've ever been responsible for mowing the lawn, you can fully appreciate the complexities that arise when taking care of green space. 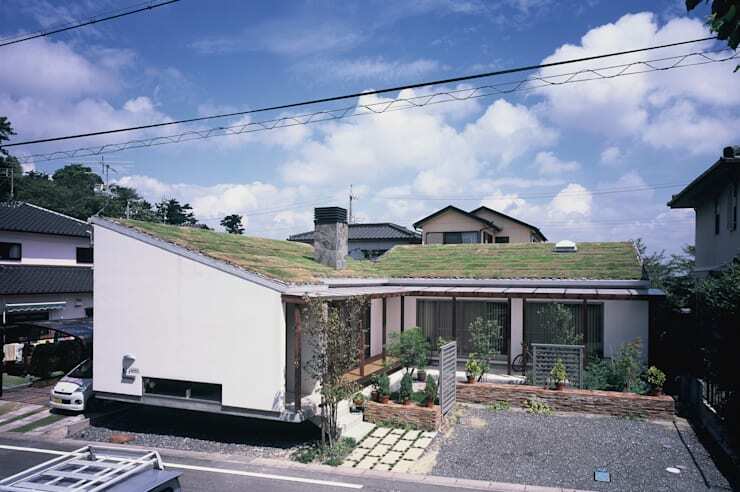 This green roof has many benefits, but it was labor-intensive to build, and involved the participation of the homeowner, the architect, and several friends and coworkers. There are several styles of green roof that vary in the types of vegetation used and the layers of rocks and waterproofing that rest below. In this case, the community team was able to construct this roof using a waterproof sheet, a water retention sheet, coconut mat and – finally – grass. Wondering how they keep it watered? They've installed an irrigation system below to automatically water the grass – although the roof will likely fare very well with the natural rainfall throughout the year. If you'd like a look at more unconventional and eco-friendly roofs, check out this ideabook with a collection of modern straw-roofed homes! Why place a window at floor level? This design is seen often in crowded urban areas where homes seek to introduce enough light without introducing the passersby on the street! That said, this low, horizontal window maintains a sense of privacy in the home while still allowing natural light to reach the inner walls. This eco-friendly home boasts a nature-infused living room, with a bright green couch for reading one of the many books on the large bookshelf. 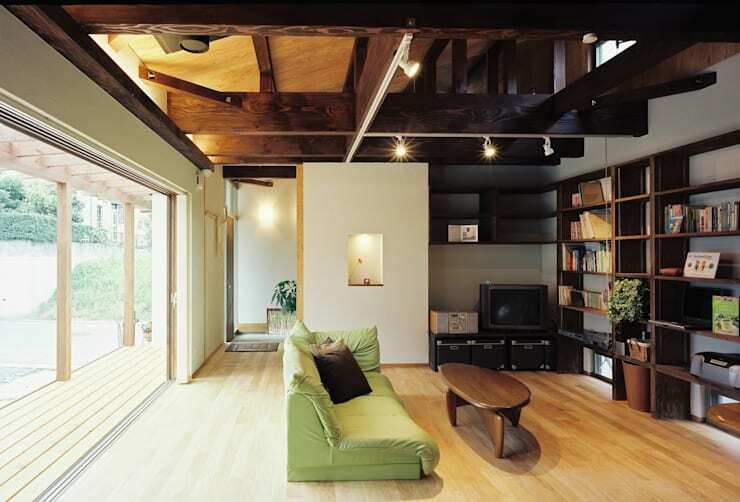 You see here what you'll see throughout the rest of the home: an open structure that allows you to see the many beams and boards used in its construction. This creates a rather edgy, raw look, giving the impression that this homeowner isn't much one for fine embellishments and polished surfaces. Another view of the living room gives you an idea of the many textures and types of wood that are incorporated into this home's interior design. There's less of a focus on matching everything perfectly, and more a focus on including as much variety as possible! Dark wooden beams in the ceiling create a strong, angled look, while the soft, rounded edges of the wooden coffee table (in an appropriate coffee-colored tone) provide a soft shape in the room. 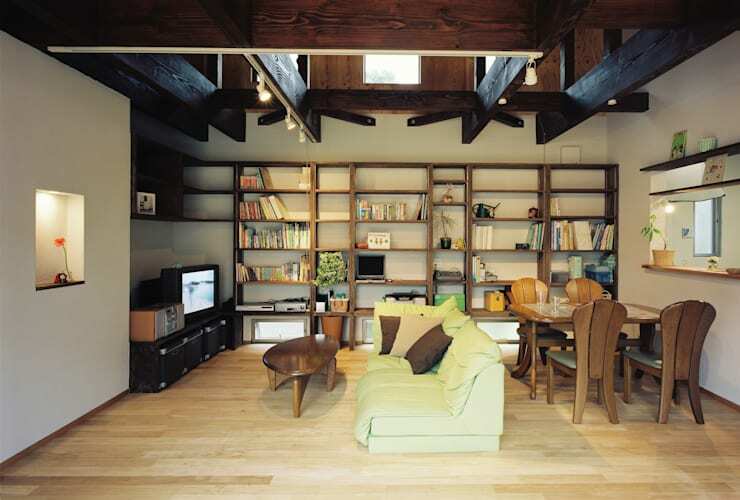 A lighter paneled floor and a bookcase in a medium tone complete the wide array of wooden hues. 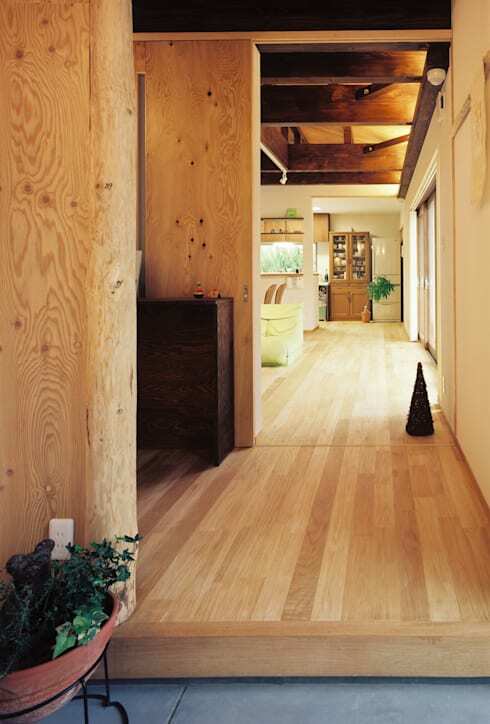 This view emphasizes the length of the room – as does the long, parallel panels of wood in the floor. Light flows in through large windows, bringing plenty of sunshine into the warm, organic space. These raw, unfinished textures are unusual finds in a finished home, but they work well with the edgy, organic look that's found throughout. This particular view displays a juxtaposition of multiple finishes and textures, in an effortless – and dynamic – arrangement that lets each piece tell its own unique story. 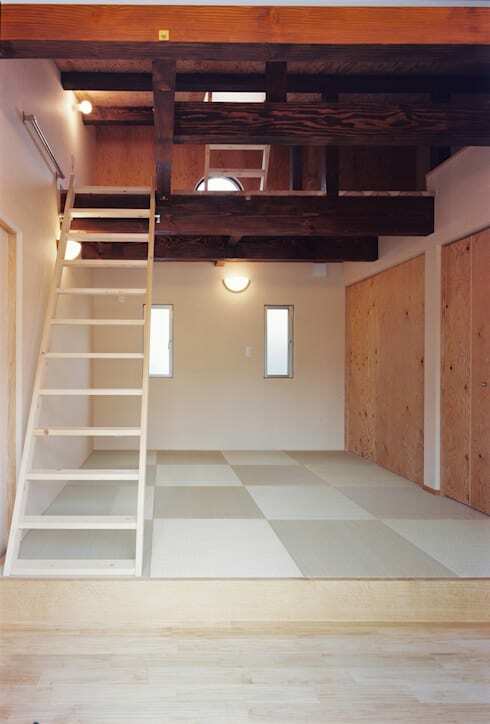 Here, a more modern geometrical pattern covers the floor, but the unfinished, organic look is still present in the closet doors. 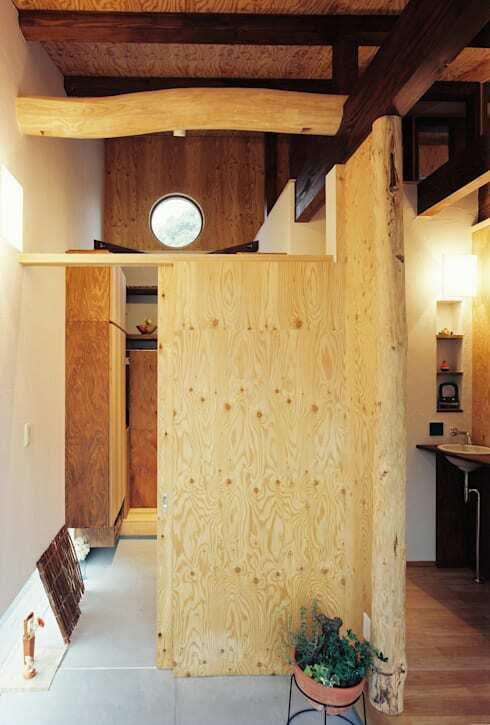 This lofted bedroom takes advantage of the vertical space, even though it's not tall enough for two full floors. Who wouldn't be tempted to sit in this tub, enjoying the relaxing views of lush greenery just beyond the window? It may seem an odd placement for a bathroom window, but the dense foliage in the courtyard keep this wide window well-sheltered from wandering eyes. A surprising feature in this bathroom is the tub – while white is typically the color of choice, it seems that black is a very practical option for anyone who enjoys a more unconventional bubble bath, and the shiny black surface provides a fun contrast to the lighter tones in the room. 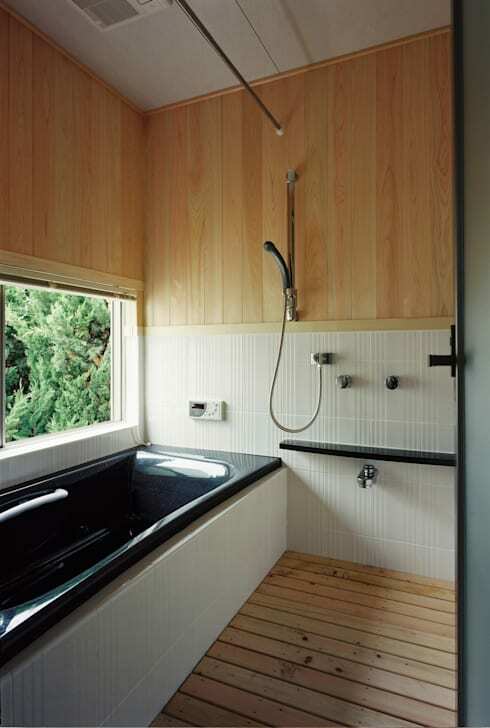 With the wood panels above and below, this bathroom emanates a woodland, sauna-like feel, perfectly in tune with the rest of the nature-infused home. 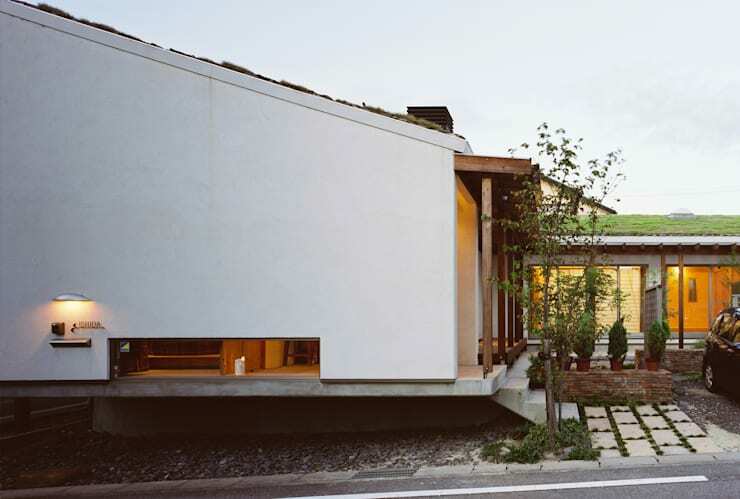 Are you a fan of this green-roofed home? Share your thoughts below!